Saturday the 4th of May. One minute’s silence was observed, in remembrance of those people who were killed and injured at this year’s Boston Marathon. Many entrants also wore black armbands. Fortunately, the expected stormy weather did not arrive until Saturday night, so ideal conditions were experienced throughout the day. Three years ago, the half marathon distance was added into the events. This year, the route had been changed, taking in more of the rural landscape with less time spent on the main road. The largely flat course provided a good fast pace, but was also suitable for newcomers and a number of ‘squad’ jog/walk groups. I found the new half marathon course to be ideally suited for Nordic Walkers. There was plenty of room to pass others, without fear of walking outside the cones, being wiped out by a logging truck, or having those jog/walkers pass you … then stop right in front, causing you to have to negotiate the ‘go by’ again! Next year is the 50th anniversary of this iconic event. 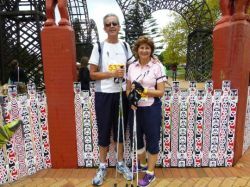 Participating in any of the event distances is to be part of history and I invite you to be part of Nordic Kiwi’s Nordic Walking team.